Commissioned by the appointed advertising agency LeePeck Group, Gorilla Media have been key in ‘driving’ potential clients to the new Copsewood Park development near Southampton. 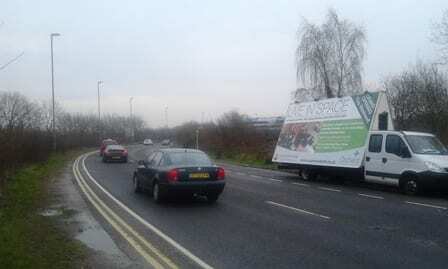 Along with a radio and press campaign, the Gorilla AdVans have been utilised by Orchard Homes to target busy retail parks and arterial routes, maximising exposure to potential home buyers. A spokesperson for Orchard Homes was quoted as saying “… enquiries have been coming in thick and fast with two homes being reserved in the first two days”. Gorilla Media work with some of the most well-known Ad-Agencies/Media Buyers in the UK and are always keen to develop new relationships in the industry.